The proposed imposition of anti-dumping duty on import of truck and bus radial tyres from China has cheered up tyre stocks in India. In a six-month time frame, tyre stocks, including MRF, CEAT and Balkrishna Industries, have all gained 45-70 per cent due to high earnings visibility and consumer nature of the business. These stocks, according to market reports are now trading at 18-23 times their earnings. 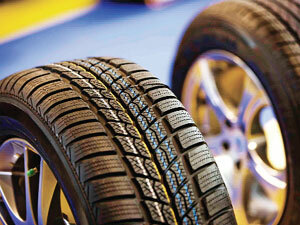 Other tyre stocks like JK Tyre and Apollo Tyres have been still trading cheap and appear to be due for re-rating. It is precisely at the same time that the Union commerce ministry has made its intentions clear about imposing anti-dumping duty on import of cheap truck and bus radial tyres from China with a view to guarding domestic rubber players. This has gone down well in market circles. Traders on Tuesday were seen piling up position. Shares of Apollo Tyres were up 4.33 per cent, MRF 1.90 per cent, shares of Bosch, which has tyre changers, were up 0.54 per cent. Shares of Ballkrishna Industries went up 3.52 per cent, Ceat 1.99 per cent, JK Tyres 4.2 per cent, TVS Srichakra 0.21 per cent, Goodyear 0.56 per cent, Modi Rubber 4.58 per cent and Govind Rubber 4.08 per cent. Significantly, the Narendra Modi government focus on infrastructure development is also expected to bo­ost the demand in the commercial vehicle segment. Good monsoon and improved rural income, too, could boost demand for light commercial vehicles. And this in turn would also impact the tyre stocks. For those who adopt positions on the basis of astrological predictions, tyre is one of the few sectors expected to receive divine support, this time in the form of crude oil prices heading southwards. The falling prices of cru­de oil, understandably augur well for the sectors, which need crude as raw material and tyre is one of them. Included in this list are companies like Ceat, Apollo Tyres, Balkrishna Industries, MRF and JK Tyres.